(Bloomberg) -- The Democratic Republic of Congo will join the global fight against Islamic State, which President Felix Tshisekedi said poses a threat to his country. 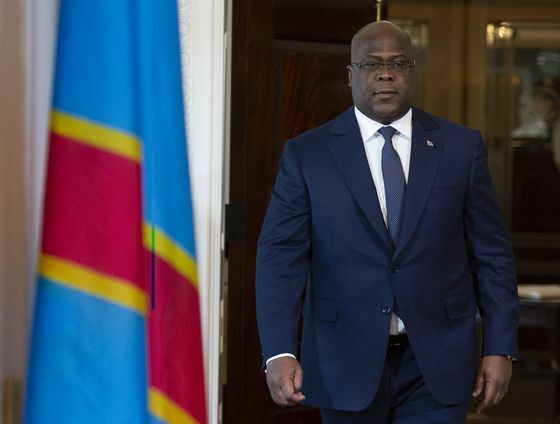 Tshisekedi stressed links between the Islamist group and the Allied Democratic Forces, a shadowy militia that has operated in Congo since the 1990s, during a visit to Washington last week. Little is known about the ADF and analysts including Eleanor Beevor, a researcher at the International Institute for Strategic Studies, question the depth of ties between the two organizations. The ADF, which was founded in neighboring Uganda, is among the most active of more than 100 militias operating in eastern Congo. Both the government and the United Nations have blamed the group for most of the attacks around the eastern town of Beni, where more than 1,000 people have been massacred since October 2014. At the same time, UN experts and New York University’s Congo Research Group say other militias and senior Congolese army officers have been involved in planning and carrying out the assaults. Links between the two organizations appear to be tenuous, said Beevor. “Individual fighters may have exchanged messages online with members or sympathizers of IS, but that kind of low-key communication between transnational terrorist networks is not unusual, and does not translate into serious practical support,” she said. There’s evidence of some financial and personal links between the ADF and IS, CRG Director Jason Stearns said in an emailed response to questions, most notably a Kenyan national arrested in Nairobi last year and sanctioned by the U.S. for ties to IS. Kenyan and American authorities have said the individual facilitated money transfers to the ADF, according to Stearns. The U.S. Africa Command considers the ADF to have “meaningful ties” to IS and probably trying to create an IS foothold in Central Africa, spokeswoman Samantha Reho said in an emailed response to questions. The ADF’s number of foreign combatants has been on the rise, recruiting from as far afield as Mozambique and South Africa, Stearns said. “But we need to be aware that the DRC and Uganda are trying to spin this so as to attract U.S. support in a war of terror,” he said. While IS “has been a deep influence” on the Congo-based militia, “we need to remember that the ADF is still an extremely reclusive group,” Stearns said. Tshisekedi met U.S. National Security Adviser John Bolton, Central Intelligence Agency Director Gina Haspel and Secretary of State Michael Pompeo during his four-day visit to the U.S. The Congolese president raised the subject of the ADF with Bolton, a spokesman said, without providing further details. Congo announced last month it will formally request the UN Security Council to designate the ADF as a terrorist group. Tshisekedi said he hoped his ally will provide training and equipment to his security and intelligence services to take on the ADF and other armed groups operating in the east. Congo’s fight against the ADF is being waged by the country’s armed forces with support from UN peacekeepers. Congo’s relations with the U.S. have improved since former opposition leader Tshisekedi succeeded Joseph Kabila as head of state in January. The U.S. put significant pressure on Kabila not to seek a third term in violation of Congo’s constitution and slapped sanctions on senior military officials involved in repressing opposition protests.